The first Integrated Systems Europe (ISE) tradeshow was held in Geneva, Switzerland in February 2004. The show attracted 120 exhibitors and just under 3,500 attendees. 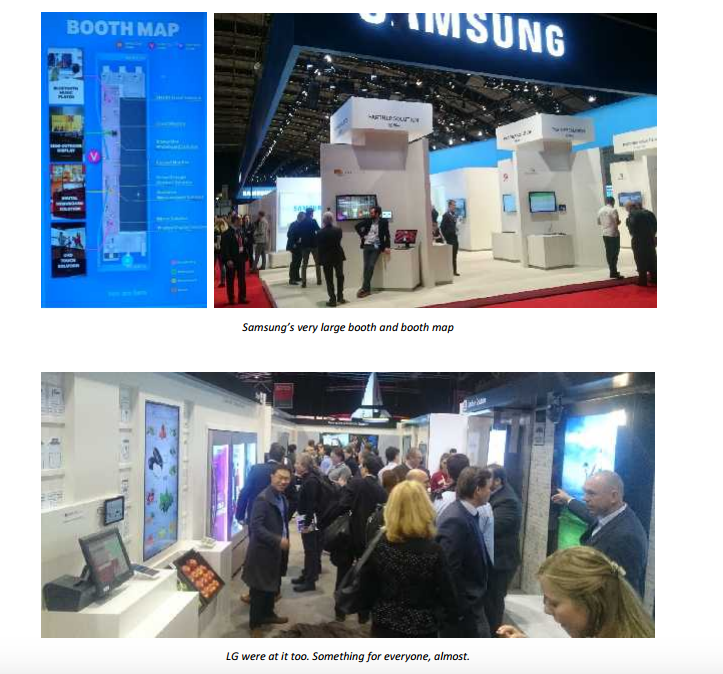 In its 11th year, ISE 2014 saw a record-breaking 952 exhibitors and 51,003 attendees pass through the doors of the Amsterdam RAI. This year, at the same location, attendance was close to 60,000. 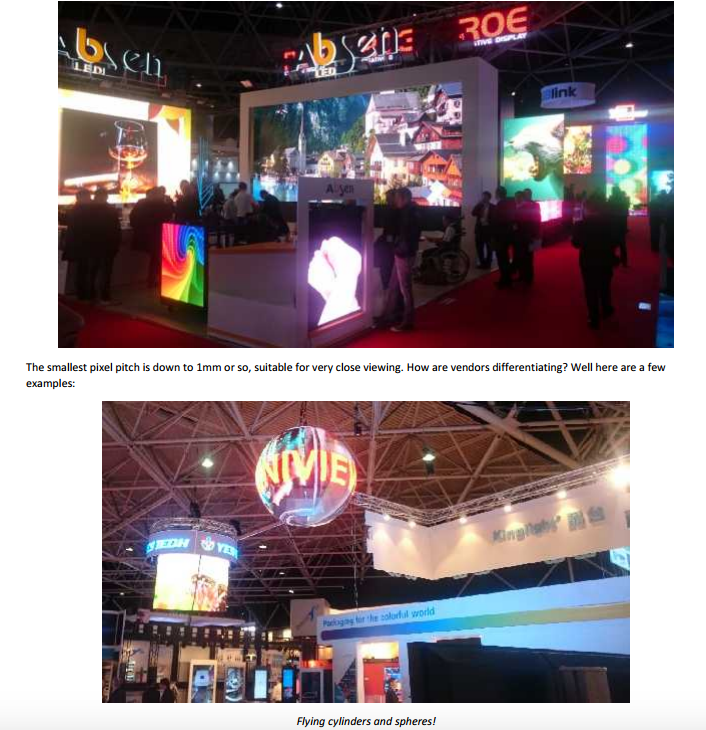 ISE is now the largest show of its type in the world. I was in two minds to attend. Having been a veteran of Infocomm since the late ‘80’s I’d managed to wean myself off this type of intensive AV-fest. My last Infocomm was 2003, on purpose. My only ISE was in 2009 and that was mostly driven by the invitation to pick up an InAVate award. Oh how cynical I’d become. But this year as the event loomed nearer, almost everyone I spoke to on this side of the pond was suggesting that I go along. “It’s the show to go to Martin”, I was repeatedly told. So I decided to compress the rest of my week to create an 18 hour gap, wholly dedicated to ISE. And thanks to easyJet, reliable transportation links and the proximity of RAI, I could squeeze in an entire show day, albeit with a 3am start. But I’m no show novice and I knew that I could only see a fraction of the four halls and endless booths in just one day. 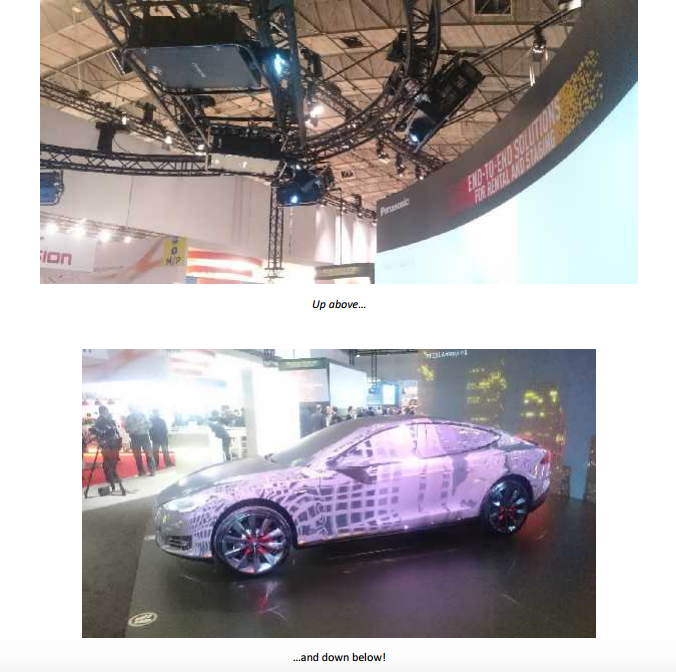 This show report, therefore, is a view of ISE from an easyJet altitude of 21,000 feet; a top level assessment of the technology, markets and players that ISE represents, sprinkled with a few close-ups of what I got to see, and hear, close-up. If you’re old enough to remember the Infocomms of the 80’s and 90’s, then your overriding impression ISE15 might be as mine; all the technology at ISE looked great, sounded great and worked. 25 years ago that wasn’t the case. Back then the variances were significant. The differences between the good, the bad and the ugly drove me to write an internal report entitled just that. There was a lot of ugly back then. But some of those were prototypes, proofs of concepts. I remember the first LCD projector, the first non-linear video editor (using hard drives), the ‘first’ laser projector, the first flat panel monitor, the first networked control system, the first LED display, the first, well everything probably. 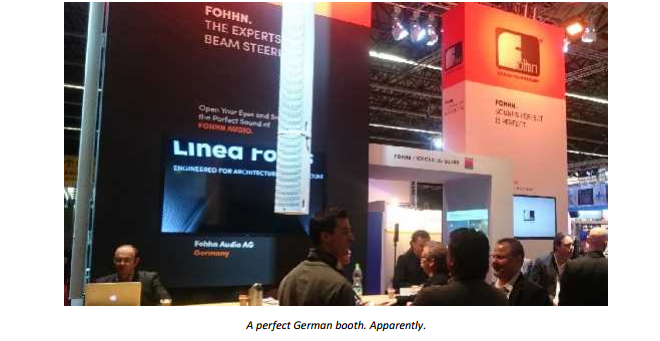 And now, at ISE all of those technologies have been fettled and refined and shipped in tens and hundreds of thousands. They all looked good. No, they all looked great. And cheap too. “How much is that projector?” I asked. “thirteen, nine, nine”. Thirteen grand was a little pricey I thought. But then I realised he meant €1,399. All of that tech, integrated into a small, light and easy to use box at a price so low it didn’t really matter. And there were hundreds of these things around. I didn’t have the time, or the inclination frankly, to start comparing. 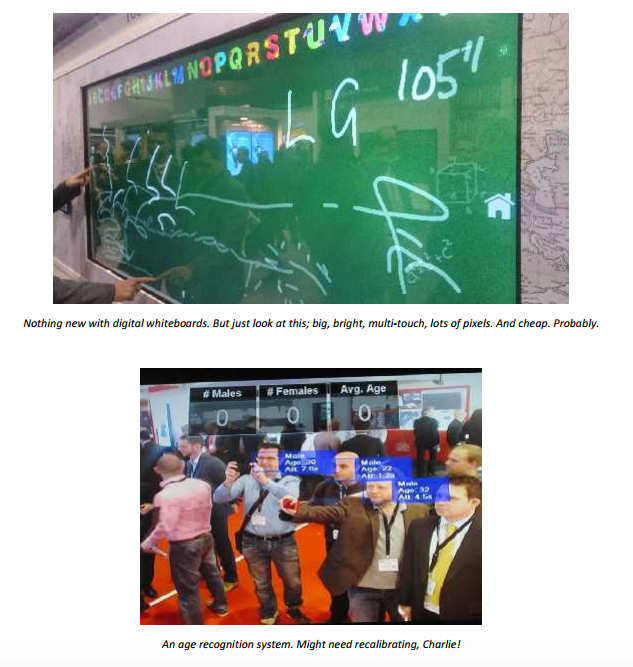 I knew I could do that online or via any of the hundreds of dealers, distributors and integrators who were also at the show, paying more attention. I could compare at some other time, close to the time I needed to know, because for sure things will have changed by then. Comfortable in the knowledge that I wouldn’t end up with a ‘duff one’, there weren’t any. 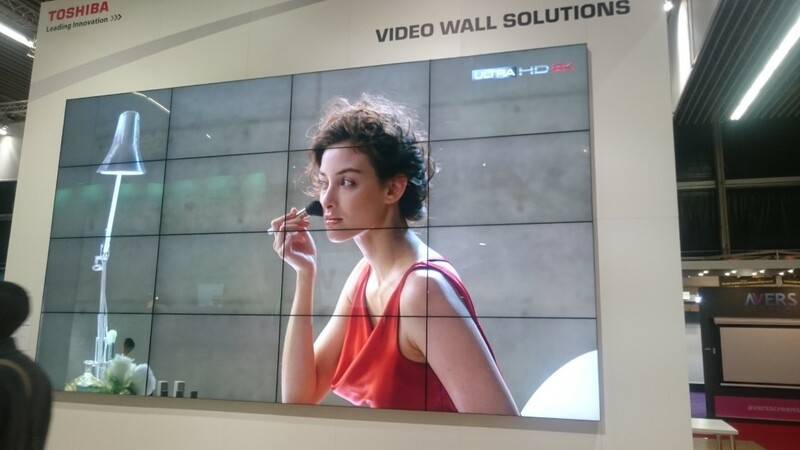 25 years ago, creating a large tiled wall of screens, or a seamless projection system, or any kind of interaction for a trade-show was a major undertaking, a feature piece, commissioned by the bravest to show off their skills. Now, just buy the bits and plug them in. It’s all integrated, there’s a menu function for almost every application. It’s all so easy now. As a result there’s more. More functionality, more capability. More products, more pixels, more of everything. And the impact of that is that more people are doing it and more people are buying it. Enough to fill four large, disorientating halls. Waiting at the airport at the end of the day I was reflecting with an ex-Barco colleague, who’s now at NEC. We tried to estimate the size of the market that ISE represents. We got up to around $30 billion and realised we could be at least 50% wrong, so we stopped counting. Nowhere was ‘big’ better represented than on Samsung’s booth. So much so they needed a booth map! 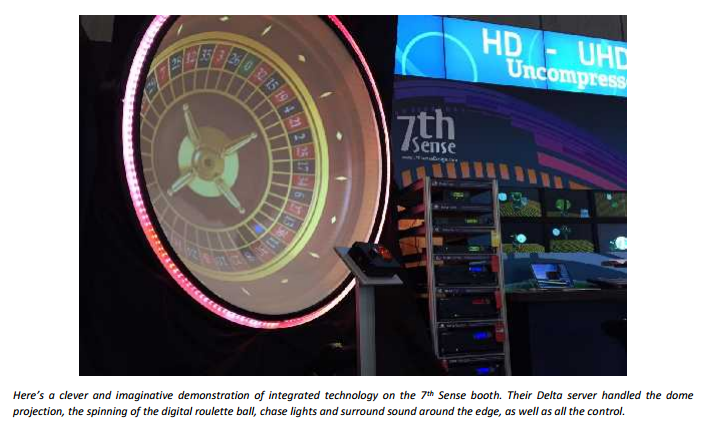 Their booth was segmented by markets and technologies. Surprisingly there were a number of technologies and markets that they aren’t present in. Yet! 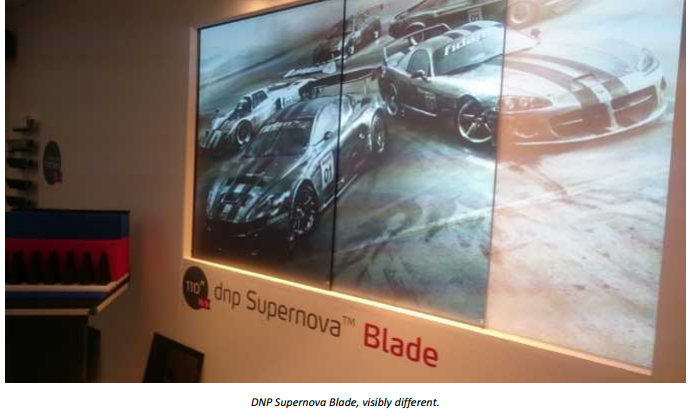 It was nice to see that DNP are still active, here they were showing high contrast front projection screens. 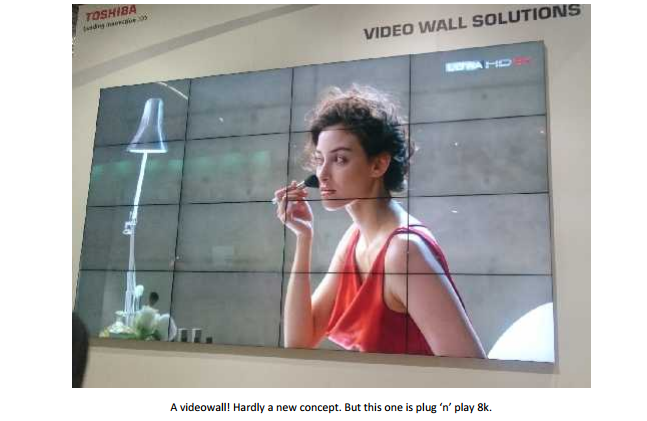 Once upon a time, AV trade shows used to organise a shoot-out; a line-up of projectors, grouped into comparable performance ranges all showing the same sequence of reference images. It was a lot of effort to produce and prepare for, but at the time it was helpful to see the performance benefits of one product over another. 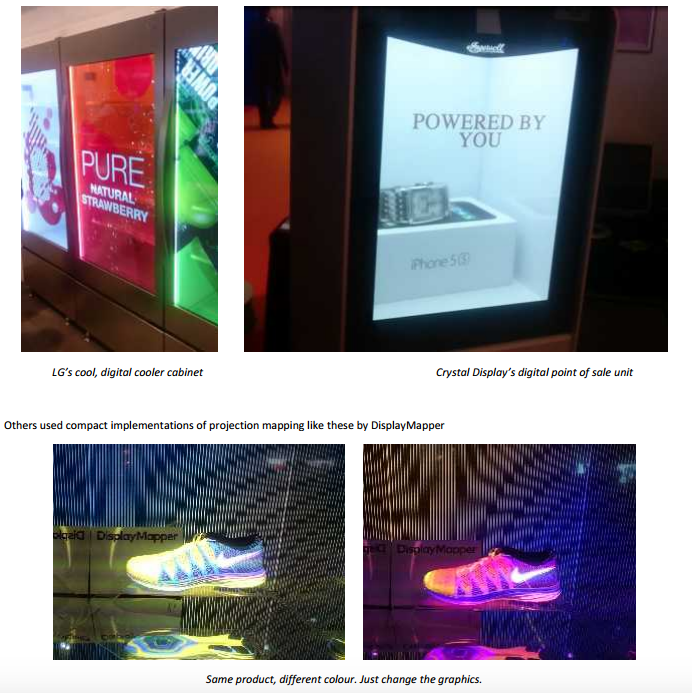 At this ISE, Epson made a bold claim and presented their own comparison of their technology vs the competition. I’m sure they have a technical justification to support the claim, but the comparison hardly looked even- handed, and as a result, probably backfired on them. We don’t want to bring the shoot-out back, so c’mon Epson, play fair. visible! We’ll be seeing more of these. Everywhere, I expect. These giant halls were filled with all manner of shapes and sizes of LED screens. It was like walking into Times Square. There’s a flavour for everyone. I spent a little while touring the sound exhibitors, articularly looking for, and listening for, 3D audio systems; configurations and technologies that add the Z dimension (up and down) to the surround systems we’re familiar with. This combination delivers up, down and all around; spatialised, immersive sound. And there were a few examples at the show. This will be the next dimension in sound systems in the same way that stereo evolved into surround sound. These 3D/Immersive/Spatialised sound systems have arrived and will, I’m told, become the norm for the future. And I, for one, believe them. 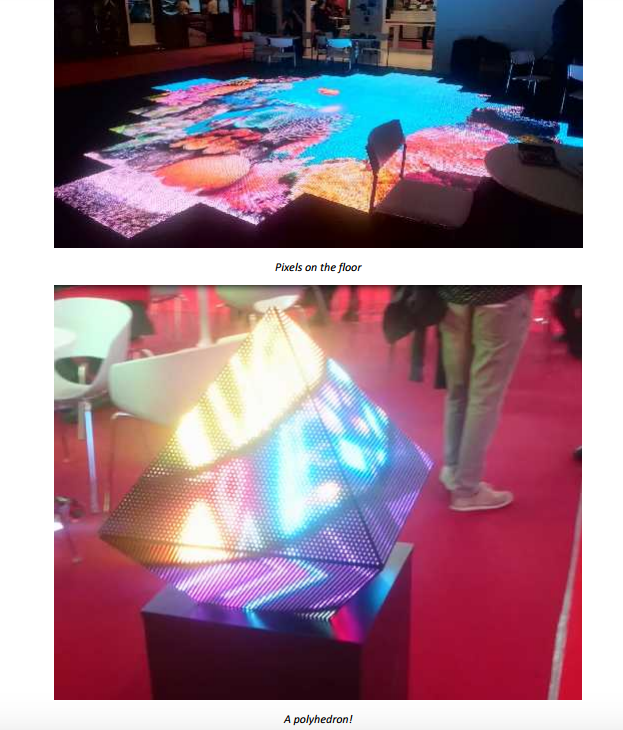 I was told to look out for the Panasonic booth which was showing an ambitious projection mapping display. 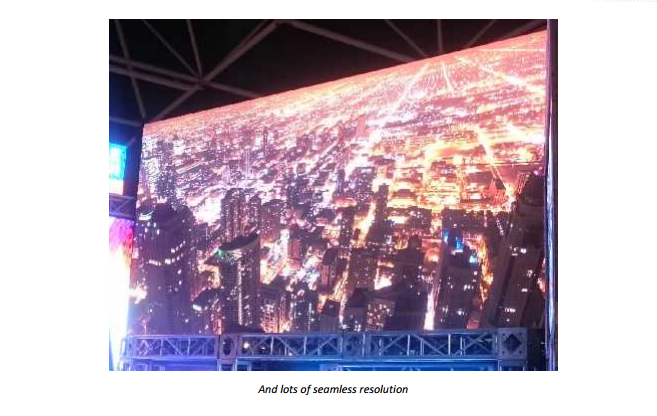 It comprised a brace of high brightness 3-chip DLP projectors using a combination of short throw lenses to projection map onto a white-wrapped Tesla car and ultra-short throw lenses to project onto a large cylindrical screen behind. Their 4k camera was capturing the action and relaying it to a large 4k flat panel on the other side of the booth. It was a clean, tidy installation powered by D3 servers and it worked faultlessly. It’s tough to pull of this kind of display under any circumstances and to attempt it at a trade-show is always risky. I take my hat off to the whole crew who must have pulled a few late nights ahead of the ribbon cutting. Well done indeed! Leaving the show and climbing back up to 21,000 feet gave me time to reflect on a busy day. Firstly, it was definitely worth going. My buddies were right, I should have spent a few days. I’ll certainly be going back next year and who knows, maybe as an exhibitor! What we didn’t see this year were examples of today’s more complex integrated technologies. 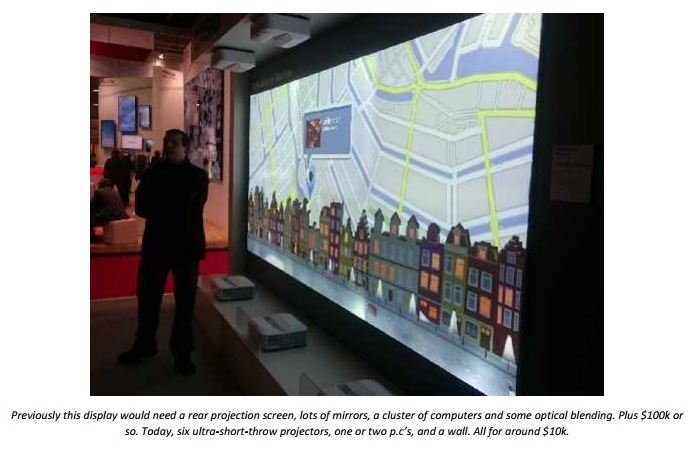 Wouldn’t it be interesting to see how projection mapping works with real-time object tracking, 3D audio and the Internet of things, where everything knows what it is and where it is; people and technology sharing and interacting in the same 3D space?! What, I wonder, will ISE look like 25 years from now? It’s hard to predict isn’t it? Probably full of affordable, reliable, plug ‘n’ play technology that works in 3D space and connects with everything else. Oh, and some robots. Hopefully I’ll be there too, by then using easyJets’ hyper drive pod and my robotic Zimmer frame. Or maybe I’ll stay at home and attend the VR version.